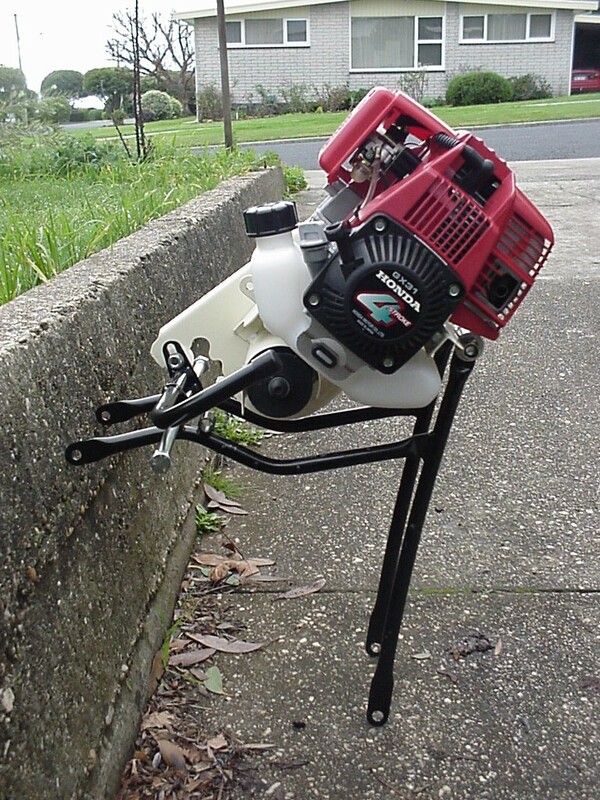 A friend here has just purchased a 'Pedal Ezy' 'Roller on the tyre' Honda Assist unit in Devonport, Tasmania, Australia. There were a few surprises for me. No instructions was the biggest and I'm not sure we would have been able to assemble it without the chance pics we took when we first spotted one in real life. 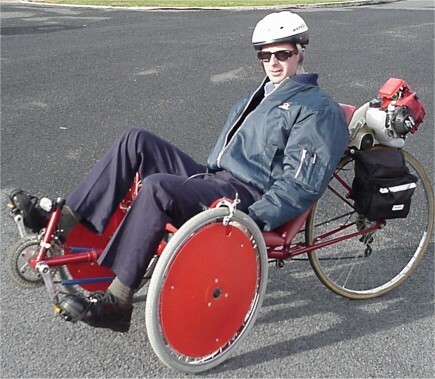 The unit is mounted on a recumbent trike so it's not as straight forward at on a normal bike but it does look pretty good. 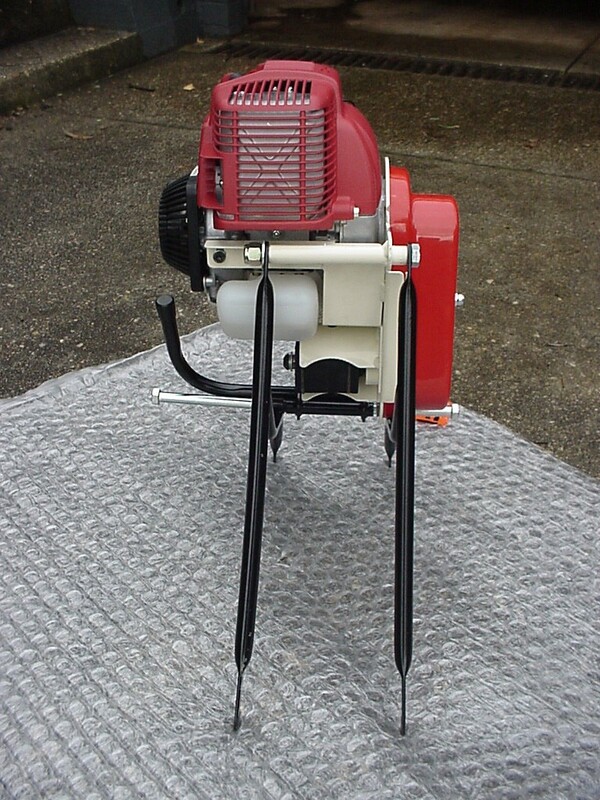 It has a toothed rubber belt gearing down the motor to drive roller. The Honda Motor has the clutch still in - roller is a hard rubber compound (I can push my finger into it if I push hard) with thread to hold it together - reminds me of a truck tyre in consistency. 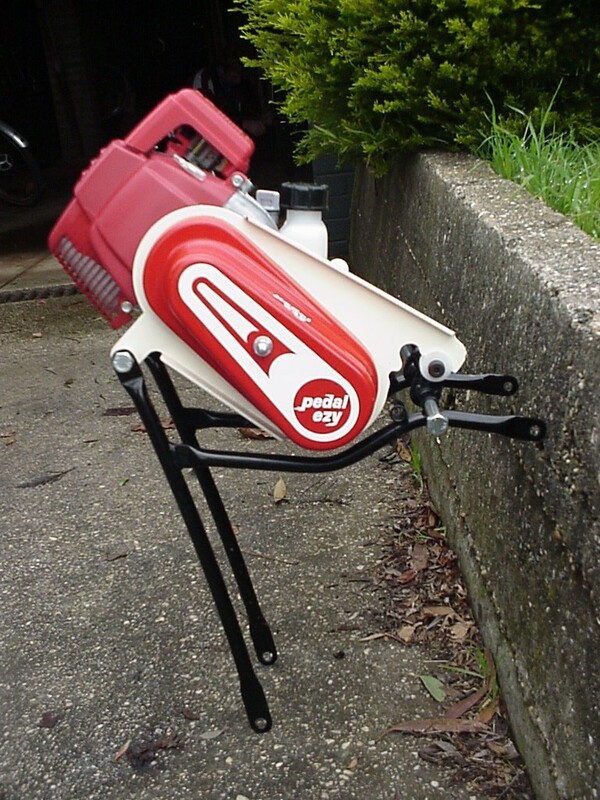 They say there's a wet weather roller for sale for $80 made out of Aluminum or steel which would also reduce the speed to 80% of the dry weather speed. Picking it all up in the box it feels pretty heavy - maybe it has to be like that but the tubing and mounting bolts could have been a lot lighter. EG there are 3 steel bolts 17mm x 11mm dia. It's noisy when you're on the machine. Stand on the kerb and you can hardly hear it at about the 20m mark but with the recumbent position making the riders head a lot closer to the motor there is quite a lot of apparent noise. Riding not more than 10 m away on another cycle and you can't hear it at all. My guess is it's a vibration resonating through the frame that adds to the motor noise but to be honest I'm not sure I could ride for more than 1/2 hr in it's present form without getting a headache. Reminds me of younger days riding motor bike powered go-carts as it has the same sort of feeling and noise level. Maybe it needs rubber damping and/or a quieter exhaust. It's powerful! I didn't have much of a go (about 10 mins) but there wasn't a hill here it couldn't easily power up and you will see in the video's it will pull away from standstill easily. I could sit on 28k/hr anywhere and it maxed out at 33 k/hr. I can't believe it's legal here although they say it is. The gearing is the only limitation on it and in Australia the legal power limit is 200w max so my guess is it's way over that. More like the 1.7 hp? as shown in Honda's specs. Starts first pull every time. That's 4 stroke I suppose but also Honda. Fuel level hasn't appeared to drop much in the 600 ml tank with all the testing we've been doing. A nut on the inside of the toothed belt cover to stop the cover from being crushed. Throttle cable supplied couldn't be connected up to the carburetor as it was. 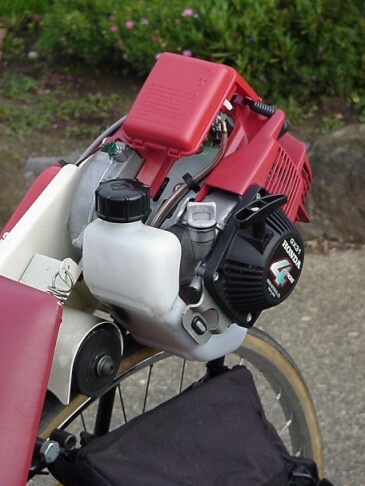 The air cleaner cover needs a self-tapper screw installed so it doesn't fly off when riding. This was advised by the supplier. There were no instructions whatsoever. This I thought was a little poor. Stated roller wear 2-3,000km before new one - about $80 replacement. 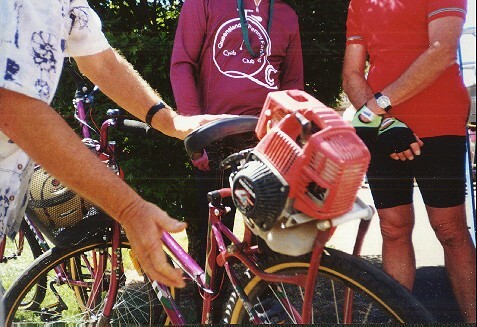 Pictures of the unit on the trike. 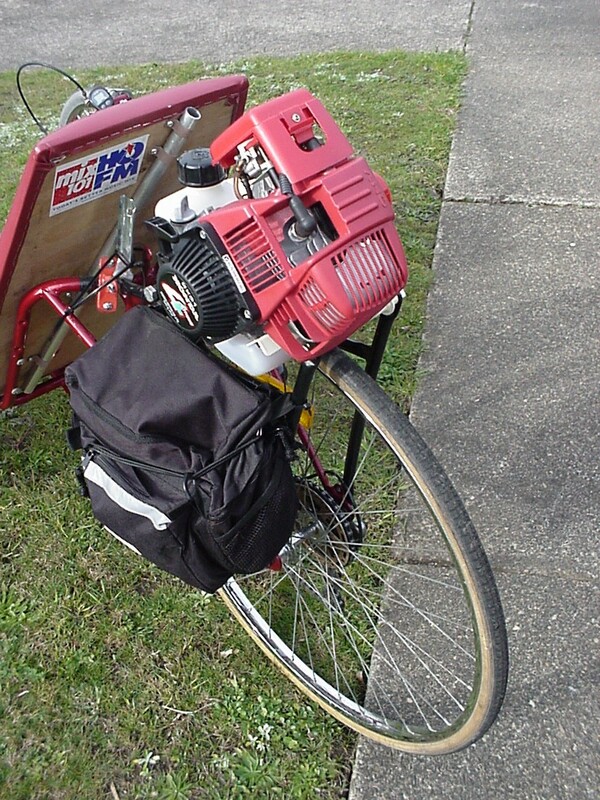 Right side view of the trike. Left side back Roller - As you can see the roller and/or tyre sheds some rubber. image8.jpg - How it looks on a 'normal' bike. image7.jpg - Demonstrating how to disengage off the tyre on a bike. Pictures of the unit unmounted. 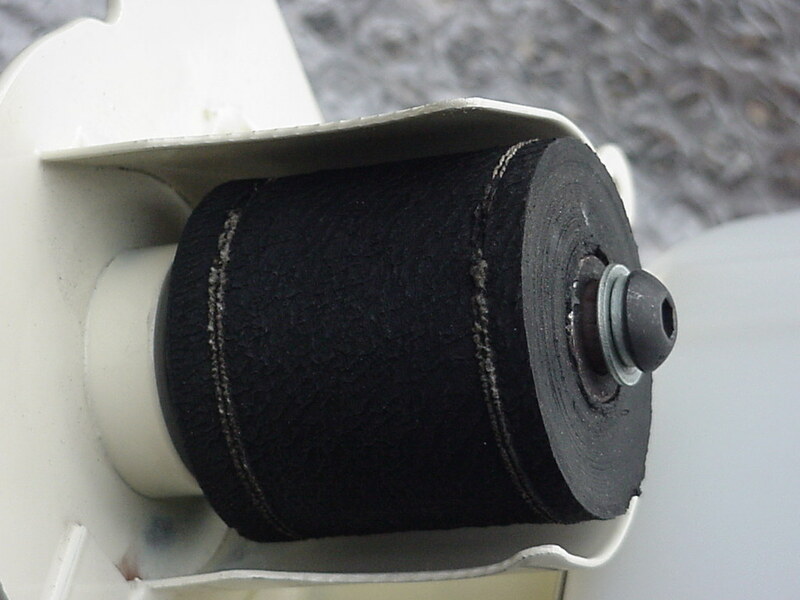 roller.jpg full unit 3.jpg - Shown close to the correct mounting angle. 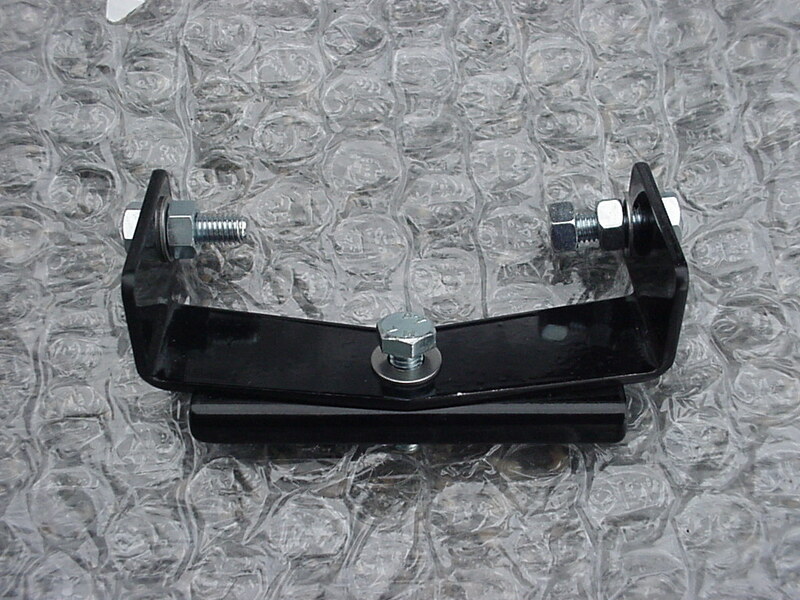 front mount.jpg - We don't need to use this but it looks like this mounts the unit to the/a bike rear brake caliper. 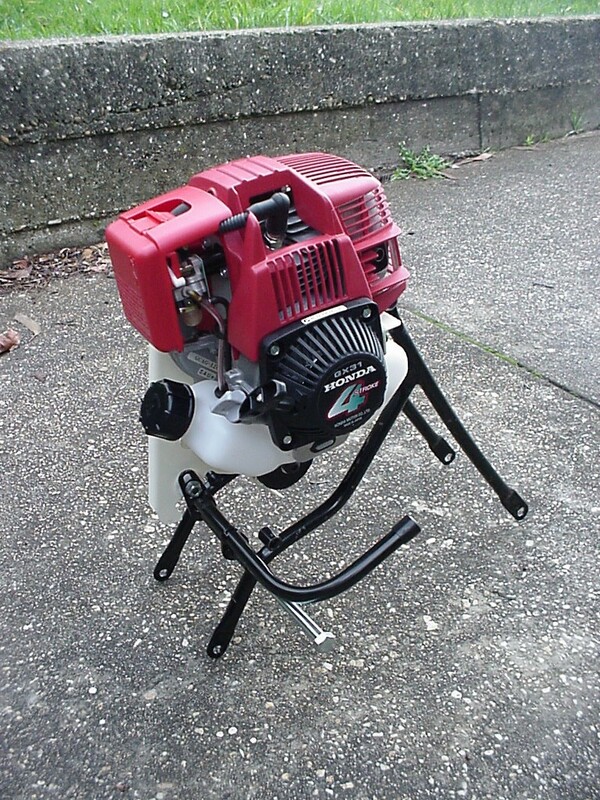 full unit 1.jpg - not quite the same position when it's sitting on the bike but close. Right of this pic faces the front of the bike. Fuel tank sits vertical. The large bolts at the bottom of pic are just to locate the mount and wouldn't stick out as shown. full unit 2.jpg - Shown close to the correct mounting angle. Video's on the trike and motor in action. Apologies for the wind noise in the background. Riding past - 320X240 - 5 sec - Size 475k - MPEG format Doing a U-turn - 320X240 - 15 sec - Size 1.4 meg - MPEG format Engine running with machine at a stand-still. 160x112 - 5 sec - Size 119k - MPEG format. Riding past - 160x112 - 6 sec - Size 135k - MPEG format. Turning - 160x112 - 16 sec - Size 359k - MPEG format. Riding away - 160x112 - 5sec - Size 119k - MPEG format. Here's a reply to my questions shown above about the Pedal Ezy. 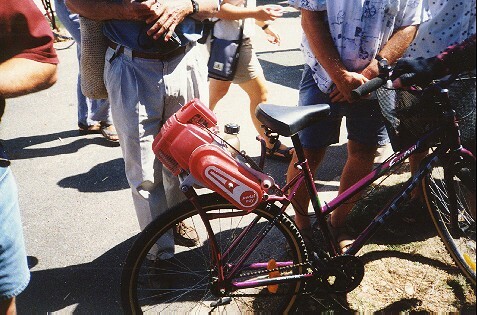 From: "Chris Franson" powercyc@arcom.com.au - Power Cycles. Instructions: nearly every fitting is different so it is difficult to cover the general fitting with a instruction manual.what I do is print off some pictures and a brief explanation of how things go together along with a couple of phone calls. Oil levels: a curly one when alone. 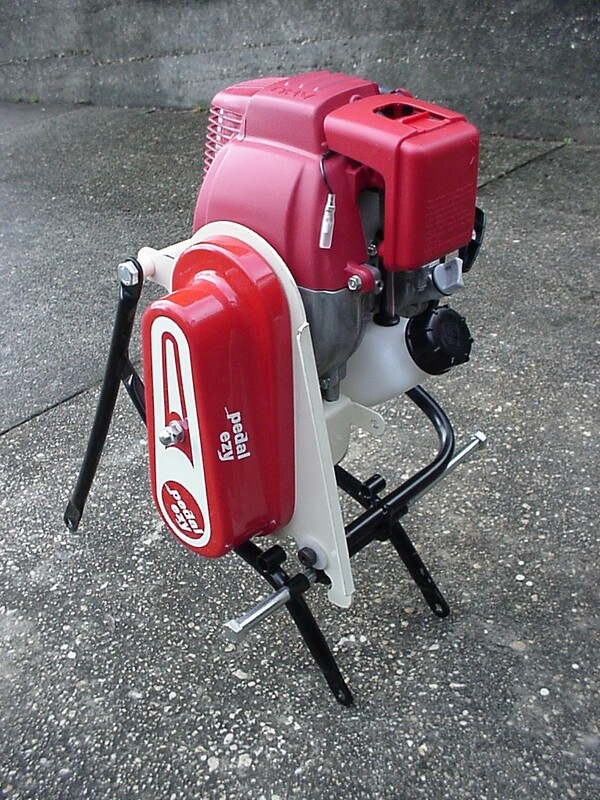 A matter of lifting rear of bike so crankcase is level.not difficult but awkward.not much you can do about it.as for oil changes Iprefer 10 hrs use and then change oil.I have been told by my local Honda dealer it pays to keep on top of the oil changes to prolong engine life. At about $8 a litre for the honda oil its a cheap oil change! Paint damage: Your kit did considerable transactions before reaching its final destination.it all arrives in good shape normally when it gets to me. Side cover: You are correct .when it left me everything was complete. It would have had 4 nuts for the threaded rod, one to lock it in place to the gearbox, 2 to lock together on the shaft to determine correct length and one to tighten up on outside of cover so as not to crush it. Alignment: Before fitting to any bike I run a round file through holes and have had no dramas. These brackets are all made in bulk. 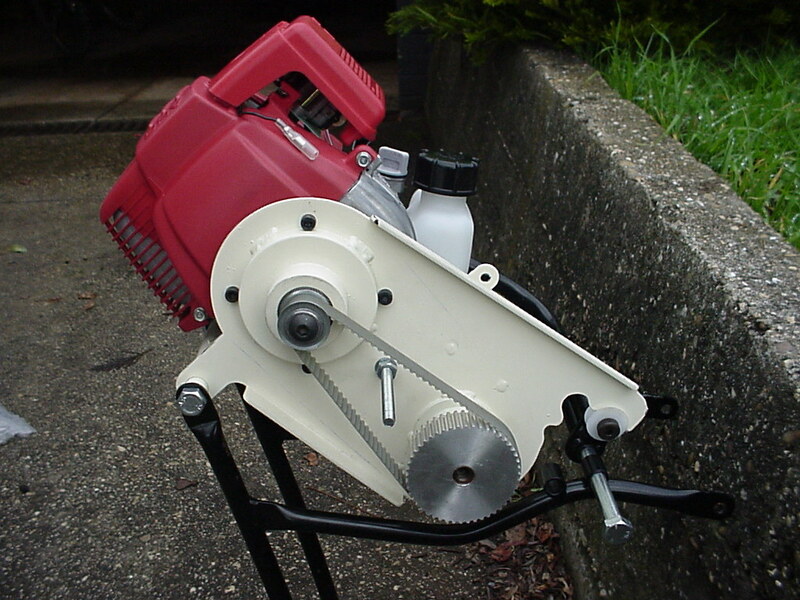 Belt: The original gearboxes had adjusting eclipses fitted but it was found after a long trial that the belts were not changing size at all the adjustment was done away with in the later gearbox. Are you aware that these belts are used in toyota cars as timing belts and actually have several strands of wire running through them. You will find it is not an issue.I can get them if you need at the price of around 50 bucks. Weight: Adrian is currently looking at the overall weight of the kit to lighten where possible. 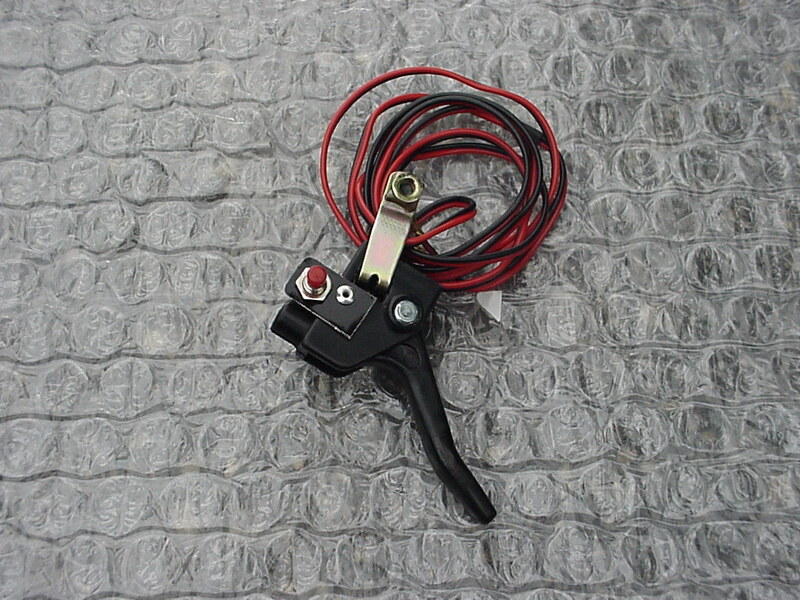 Gear lever: The kit is primarily set up for 26 inch wheeled bikes. The majority of bikes on the market are 26 and certain modifications may be necessary. Power output: Iknow what you mean. I believe legals are to change in s.a. Web site: Due to someone using the Pedalezy name the webpages has been delayed as he refuses to remove it so Adrian is looking into another name! So its on its way. I am just an agent for pedalezy at this stage. Throttle levers: Throttle levers are not a worry tim. Available anytime at about $17 complete with stop button.if you really want a rotary throttle Ican organise for you for about $50 but you have to move kill switch. Rubber rollers: The rubber used is very very tough. I am still using original rollers on all my bikes with just about no wear visible.if it does not slip and is kept adjusted correctly you will find it will not wear bugger all.I still have the original tyres on all my bikes. The semi slick tyres seem to be the best for wear as compared with the knobbly tyres. Aluminium rollers: Something I have been playing with for some time and am very happy with the results. I ride to my real job every day and was not happy with the drive in the wet, so did some homework and had a good success with an aluminium gear type roller At first Ithought it would take care of tyres but no difference. I have registered with www.power-assist last night and hope to get a bit of time to look into it more thoroughly tonight.